This online slots game is powered by Pragmatic Play, Aztec Gems is a 3-reel slot set in a moonlit jungle surrounded by elegant waterfalls. The simplistic game play and slick graphics make this game completely different from your typical video slot. Despite being a 3-reel slot, a 4th reel has been implemented to multiply each winning combination by a random amount. As you hunt for hidden treasure in the depths of the jungle, you’ll be assisted with Golden Totem Wilds and the Win Multiplier reel. Experience Aztec Gems today and see how much treasure you can collect. Play casino slots games by Pragmatic Play! The mysterious and intimidating music that introduces you to this slot immediately sets the tone for your gaming experience. 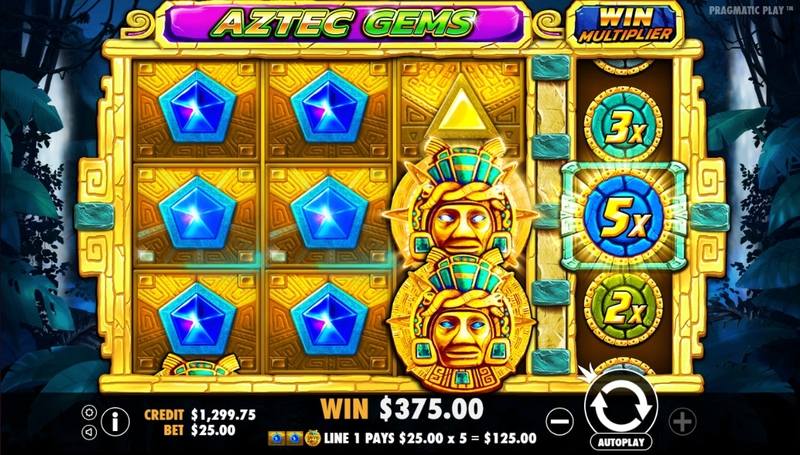 Considering there are no in-game bonus features within Aztec Gems, it’s all down to the base game to deliver big wins. The 3-reel setup has 5 pay lines on offer and an additional Win Multiplier reel which definitely has the potential to make up for the lack of bonuses. The gameboard is filled with 7 different coloured gem symbols which will make up all of your wins. The most lucrative symbols are the red and purple gemstones, which will pay significantly more. * GOLDEN TOTEM WILDS – This symbol substitutes for all other symbols and work incredibly well with the multiplier reel. Multiplier applies to all winning lines on that specific spin. Hitting a 15x multiplier on the best base game symbol can return a huge amount. The initial reaction of finding out that Aztec Gems has no bonus features can prevent players from playing this slot, but you’ll be missing out. The base game with the added multiplier reel make for an exciting experience which can produce big wins. The thrilling animations and simple game play are the perfect combination for a successful online slot. Take a break from high volatile slots and take a trip to the jungle to see how much hidden treasure you can find. 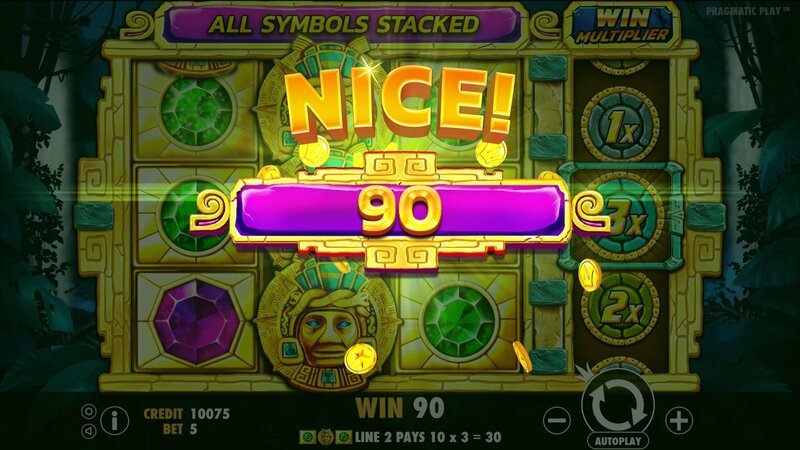 If you enjoyed Aztec Gems why not try another popular online slots here on Easyslots.com.